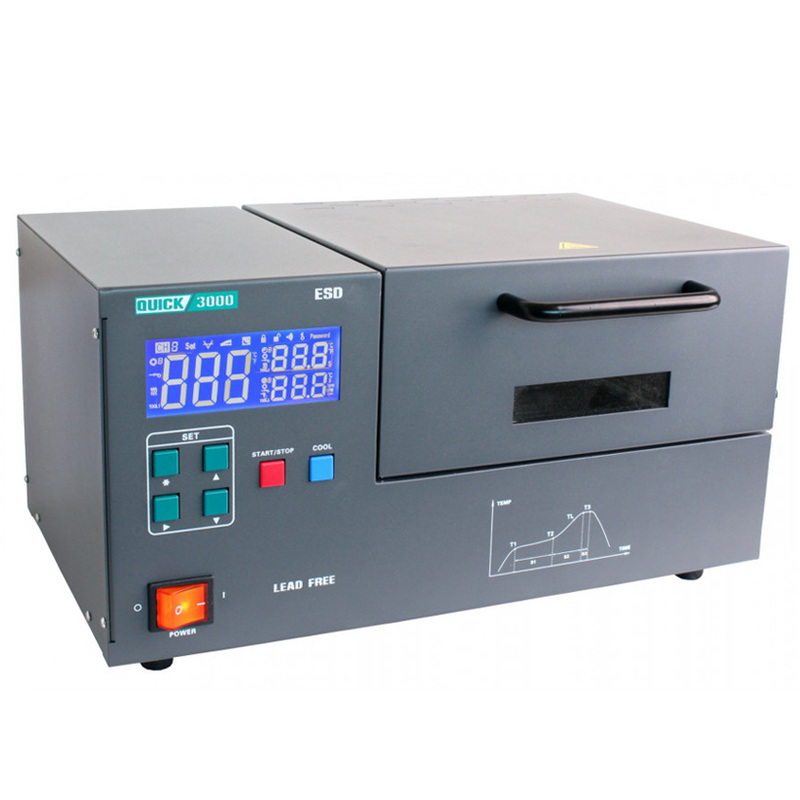 Aoyue HHL3000 Programmable Reflow Oven has a soldering temperature sensor board, a five-point temperature control / time, two profiles soldering, ability to reset checkpoints and is suitable for lead-free soldering. The maximum rate of temperature rise is limited by industry standards to 0.01 ° C / s - 3 ° C / s. The fully digital control and reading performance. 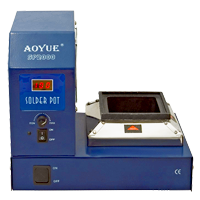 Aoyue Lead Free Solder Pot SP2000 is a digitally controlled solder pot, having a suction fan noxious fumes, 600W heater and a ceramic container on the tin. Suitable for lead-free soldering. The ceramic tank, tin does not stick to the walls of the tank and is not contaminated. Applied shape of the tank to prevent spillage of the hot tin. Designed to recover tin from the PCB. Quick 3000 reflow soldering kit uses black infrared heating and a closed loop sensor to ensure temperature stability and stable temperature control. The lower heater is a ceramic tile generating black infrared, while the upper heater is made in the technology of infrared fluorescent lamps. This combination ensures maximum minimization of temperature differences on the BGA object and protects it from damage due to overheating and against so-called cold solder. 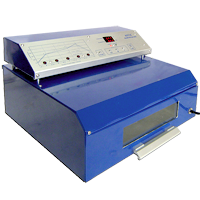 Solder pot Quick 100-15S 600W rectangular solder pot is a well constructed unit with an excellent sized solder bath for both wire tinning and small Pcb soldering. Solder pot Quick 100-4C 200W is an ideal solder pot for low to medium volume wire tinning with a temperature range that will accommodate both Leaded and Lead Free solder alloys. Solder pot ZB100D 380W are portable and primarily used for melting solder, dip soldering small circuit boards, tinning the ends of wire leads, re-tinning soldering iron tips. 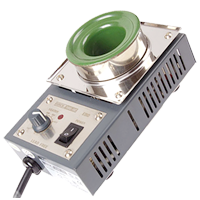 Solder pot is very useful for smaller jobs where reliable control of soldering temperature is essential. Solder pots includes dross skimmers. Solder pots are available in porcelain and cast iron crucibles. 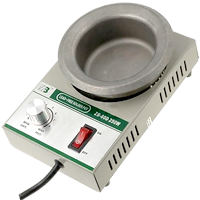 Solder pot ZB38D 150W are portable and primarily used for melting solder, dip soldering small circuit boards, tinning the ends of wire leads, re-tinning soldering iron tips. 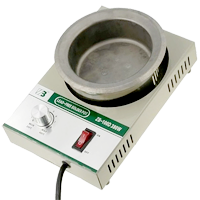 Solder pot is very useful for smaller jobs where reliable control of soldering temperature is essential. Solder pots includes dross skimmers. Solder pots are available in porcelain and cast iron crucibles. 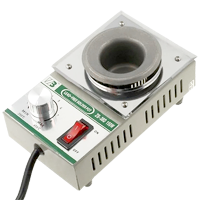 Solder pot ZB80D 250W are portable and primarily used for melting solder, dip soldering small circuit boards, tinning the ends of wire leads, re-tinning soldering iron tips. 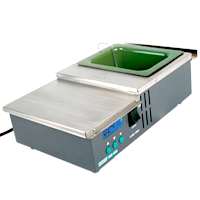 Solder pot is very useful for smaller jobs where reliable control of soldering temperature is essential. Solder pots includes dross skimmers. Solder pots are available in porcelain and cast iron crucibles. Tygiel lutowniczy Quick 100-6C 400W przeznaczony do szybkiego i ³atwego pobielania koñcówek przewodów, usuwanie lakierów i emalii, pobielanie koñcówek drutów nawojowych, monta¿u elementów przewlekanych.